A relationship working as a partnership is, in part, where both partners are bringing their strongest and best skills in love, creative ideas, knowledge, know-how, etc to the relationship, in turn making the relationship stronger by building and binding with the finest both partners can bring. If both partners work it right, they can learn, watch, study, ask questions and become better, simply by following each other’s example. In saying this, I think it is important to note that there are some partners who will allow the stronger partner to take the lead, only to make them do all the work in the relationship, while they are sitting back, putting minimal work in, and making mistakes without fixing them. 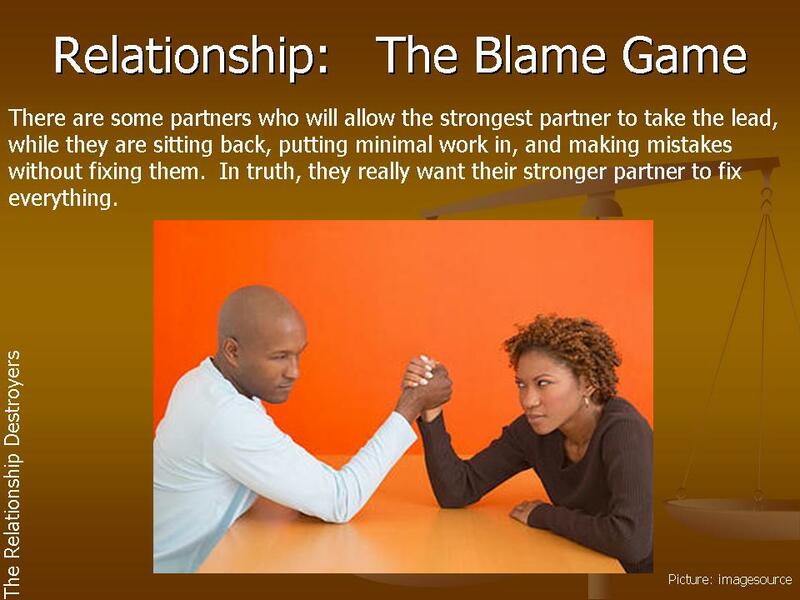 In truth, they really want their stronger partner to fix all of the mistakes in the relationship. The problem with fixing everything is that the partner who sits back, and putting in no work is the first to blame the stronger partner for the failures in the relationship. I have a friend whose partner went out of town during the Thanksgiving holiday. (They do not live together.) She called him a few times, and he never returned her calls. They always connected everyday in their three year relationship, so she thought it odd he never reached back to her. Five days passed before he called her. The only thing he cared to share was that his aunt died, there was some family turbulence, and the funeral was local. So, he left town, she is not sure where, and he returned home to attend the funeral. She had no more information than that. Rather than inquire about the details, in trying to be supportive, she answered his questions when asked how her holiday was. She told him, but took notice that he was not very open about his being away during the holiday. She is not the type of person to nag, push, or pry. She thought he would talk about it later. Thinking he needed space, she pulled back just a little. After all, he did not tell her the funeral details about his aunt, which would have been helpful for her to know, so she could support him. When she tried calling him a few times, she began to notice that he didn’t pick up her calls as often as he had done before. They always took time out for each other. Strangely, when he did return her calls, it was mostly after midnight and she was asleep. She was concerned that the situation would get worse before it got better, yet she went along with the flow in order to observe just where this new behavior and new direction of the relationship was going. Their interactions became few, awkward and fragmented. When he had to end a telephone conversation suddenly, he said he would call her back, but didn’t. The whole equilibrium of the relationship was off, because his behavior was different. This made the feel of their relationship different. So she decided to say something. She told him he had become distant since Thanksgiving. He gave no response. She mentioned their synchronicity was off. He said nothing. She also told him he was teaching her to live life without him. Nothing. Only when she said, the words, “….and I was really liking you” is when he responded with, “Like me”? He then responded by saying, “How about me teaching you to love me more”. Her response was, “Cool. In order to teach more love, you must first have it to teach it”. He responded with, “I am done. You are right”. She explained creating distance between them, due to his recent behavior, does not promote more love, but only distance. After all, in order to receive love in abundance you must give love in abundance. He says, and I quote, “Well this love of which you speak, you too must be void of it, because if you showed me love by example, our relationship would not be where it is today. No strong wind can knock a love like that”. She responded to him calmly by saying, “Well the love I have shown to you and told to you, you fail to see, because you are tainted by the hurtful loves of your past. If you could break free of your past and see me, you would see the love I have been giving to you. If you wouldn’t back up every time I say the words I love you, we would be better off”. He responded with, “You can tell yourself that if you want to”. His response was, and I quote, “Have a good day”. In conclusion she left him with the following thought. “If by example, I cannot encourage you to be more open with me in simply communicating, I am less inclined to open my heart further, and risk more hurt to love you any more than I have already by example”. This entry was posted in Destroy and tagged blaming your partner for your relationship failures, not giving your best in a relationship, not taking responsibility in a relationship. Bookmark the permalink.